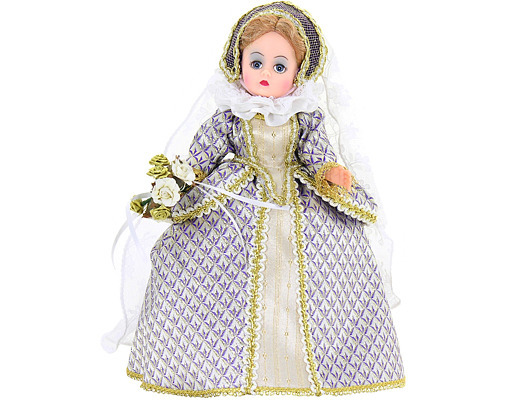 10" blue eyed Elizabethan Bride is dressed in a lavish gown of silver brocade woven with a pattern of purple and gold, and trimmed with intricate gold braid and gold lace at the cuffs. Her dress has a contrasting panel of gold brocade down the front and a wide Elizabethan ruffle of ribbon and lace at the neck. Her long white lace veil is attached to a purple brocade cap, and tiny faux pearl earrings. Her long blond hair is worn in a bun at the back of her head. Retired item - available for limited time.